The village resort of Les Houches is located in the Chamonix valley in the Haute Savoie, only 6km from Chamonix, the world capital of skiing and mountaineering. Situated at an altitude of 1000 metres and lying at the foot of Mont-Blanc (4807m), Les Houches offers an exceptional panorama of the peaks surrounding Chamonix. The village is made up of a number of hamlets, with oratories, chapels, old bread ovens and farms bearing witness to its past and being the objects of particular attention today. 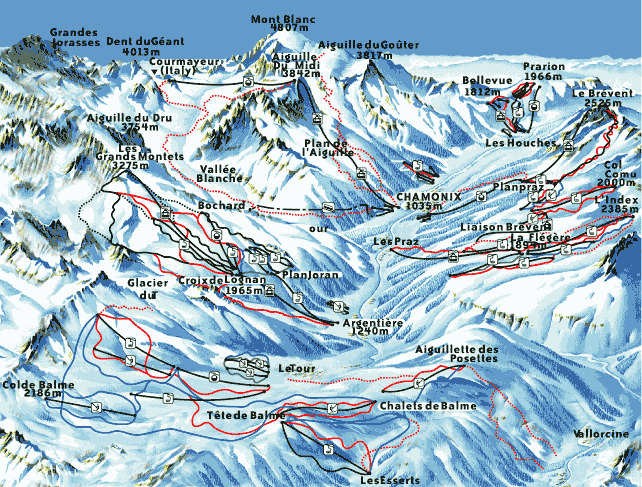 The 'Verte' piste in Les Houches is green in name only, for this famous slope is in fact a black run of 3343 metres in length with 870 metres of declivity. The best skiers in the world race down the slope in just under two minutes. With its series of technical passages and jumps, including La Cassure and le Goulet, the Verte is one of the most beautiful downhill slopes in the world. During the winter season Les Houches offers a host of activities: Dog sleighs, Ice skating, Snowshoeing, Climbing, Paragliding, Air Excursions, Local Markets.